The mainstream media feature pro-Israeli supporters. Doing so makes them complicit with Israeli crimes. His commentary shows appalling ignorance, support for Israeli lawlessness, racist hate, and contempt for besieged Gazans. “Israel wanted nothing more than to live in peace with this independent Palestinian entity,” he claimed. In 2005, Israel disengaged from Gaza. It did so to get Jews out of harm’s way. Palestinian West Bank land was stolen to accommodate them. War was planned with no timeline. Cast Lead followed. Now Operation Pillar of Cloud. More coming. Stay tuned. Occupation of Gaza doesn’t exist, claims Krauthhammer. Explain it to 1.7 million oppressed Palestinians. They’re isolated in the world’s largest open-air concentration camp. Its harshness replicates Nazi-enforced Warsaw ghetto conditions. Humanitarian crisis conditions persist. Borders are closed. No one gets in or out without hard to get permit permission. Israel bombs, invades, and commits other atrocities at will. It maintains total control. Palestinians have no say whatever. “Israel has once again succeeded in defending itself,” claims Krauthhammer. Irresponsibly he called months-ago planned naked aggression self-defense. Rabbi Avichai Ronsky calls himself a man of God. He’s also a former chief Israeli military rabbi. He’s more concerned about militarism than Judaic doctrine. His comments show it. Ending conflict was “a great mistake and a disappointment,” he said. Killing and injuring Palestinians should have continued. Israeli Deputy Foreign Minister Danny Ayalon said Palestinians killed and injured in Gaza “deserved it.” Noncombatant status gave them no immunity, he believes. Dutch writer Leon de Winter advocates involuntary eugenics. He wants chemicals added to Gaza’s water to sterilize Palestinians. He said so at an Wednesday evening Amsterdam solidarity meeting with Dutch Jews. Indeed not because Israel and Washington won’t tolerate it. The mainstream media don’t explain. They suppress truth, support lawlessness, and blame victims for Israeli crimes. People of conscience get no say. They’re denied op-ed space and air time. It’s reserved for warmongering, support for pro-Israeli viciousness, and anti-Palestinian vitriol. Israel wants Palestinian resistance weakened, not destroyed. Timing perhaps relates to other regional events. Neighboring countries are affected. Israel is impacted or fears it will be. It’s only able to intercept “fairly primitive rockets.” Most more sophisticated ones land untouched. Take Israeli claims with a grain of salt. It wants adversaries to think it can foil them. Michel Chossudovsky called attacking Gaza “Part of a Broader US-NATO-Israeli Military Agenda.” Conflict beginning on November 14 was well-planned months in advance. Israel deliberately provoked it. In fact, Pillar of Cloud is Israel’s latest naked aggression. Obama approved it. Washington and Israel partner directly or indirectly in all regional conflicts. Timing is always significant. Attacks followed one week after US elections and ahead of scheduled January ones in Israel. Pillar of Cloud was no isolated event. It relates directly to a broader imperial regional agenda. More wars are planned. Syria appears closer to full-scale Western intervention. Hezbollah may be targeted. At issue is isolating Iran, increasing pressure, and perhaps attacking its nuclear and military infrastructure. Don’t expect the mainstream media to explain. Jonathan Cook also said Obama approved Pillar of Cloud. Key is understanding that major Israeli campaigns require US approval. It’s generally automatic. Both countries partner in regional conflicts. Disagreements, when they occur, largely reflect timing and perhaps tactics. Pillar of Cloud had nothing to do with Palestinian rockets or Israeli self-defense. These type claims are ludicrous on their face. Yet they’re repeated nauseam. Most people believe them. Doing so let America and Israel get away with murder. Cook said Israeli attacks target “an occupied, largely unarmed civilian population.” Doing so violates international law. Israel’s attacks were strategically timed. Other relevant issues also matter. The media suppress what viewers and readers most need to know. They’re on their own to find out. Western inaction shows complicity with Israeli crimes. Washington, EU states, and other NATO partners share responsibility. End Gaza’s blockade. Let people and goods move freely. Ease a humanitarian crisis. The world no longer can wait. Palestine is being “battered to death.” Stopping it must be enforced. Signatories included Ilan Pappe, Nur Masalha, Tariq Ali, Steven and Hilary Rose, Ali Abunimah, Terri Ginsburg, Nurith Peled-Elhanan, and Sid Shniad. They and millions of others care. Slaying the beast requires heavy pressure. Keeping it unrelenting is vital. Israel willfully attacked civilians disproportionately. Around 170 were killed. Others will perish. Bodies under rubble will be found. Over 1,000 were injured. Nearly half were children and women. “At least 963 houses were damaged or destroyed.” Most were willfully attacked. Support for and/or statements on behalf of Israel made by Washington, EU nations, and UN officials raise deep concerns. They call Israeli aggression self-defense. 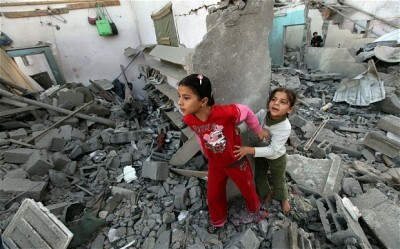 They ignore besieged Gazans and occupation harshness. They endorse Israeli collective punishment and belligerence. They’re silent on grave international law beaches. They’re mindless about appalling human suffering. They let Israel get away with murder. Other human rights/activist groups and Palestinian supporters made similar statements. Palestinians are human beings like Jews. Their rights matter no less. It’s time they got world support. It’s time culpable Israeli officials and complicit allies were held fully accountable. Palestinians have been denied far too long.